Last Thursday, I was home, waiting for some repairmen to come and fix a shelf in one of the bathrooms. Unfortunately, when they came, they were unable to fix the shelf — they were plumbers. They came, they saw, they left… and we began to get ready to go to the pool. Two minutes later, the bell rang with three other repairmen. Sadly they were not here for the shelf. Instead, they were here to fix a shutter and put up a fence. Good thing I was home! 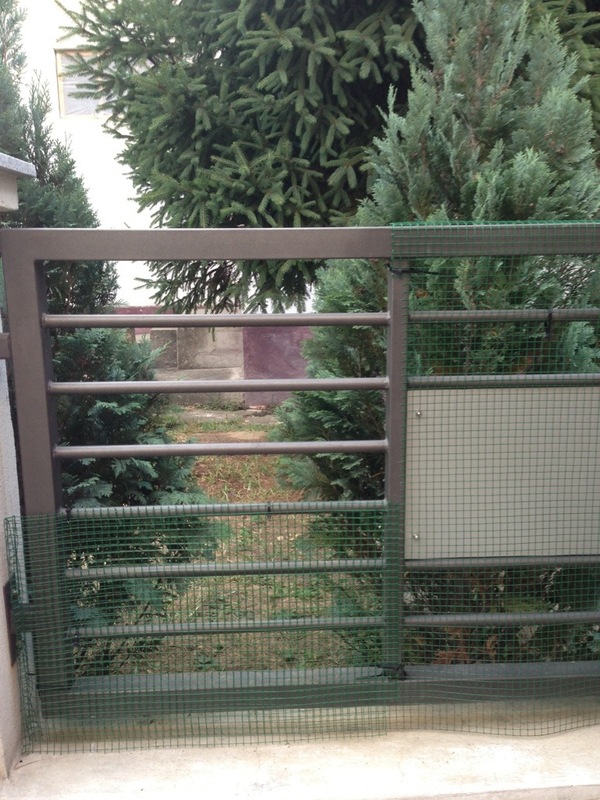 We do have a fenced-in yard; however, much of the fence has holes/openings through which Scarlett can (and has) fit. Shortly after we arrived, we requested that a barrier fill in the necessary areas so she couldn’t go exploring, and they were finally able to accommodate us last week. I went outside to see their progress and noted that they were doing a great job — and that our backyard neighbor was glowering at them. I went over to tell our neighbor that it was for Scarlett, so she couldn’t escape. He was concerned that his granddaughter and her friends would no longer be able to pet Scarlett as they had been doing. He just shook his head at me. I explained (using hand motions, since my Serbian doesn’t go that far) that they could still pet her over the fence, especially if someone was around to pick her up for them. Again, he shook his head, then made a face and walked away. From then on, he ignored us. Even after Grant cut a hole in the fence for the girls and showed both them and Scarlett, he continued to stay at the far end of his yard, refusing to acknowledge us. I should note that this neighbor had previously taken it upon himself to make sure we were able to take care of our lawn and who would regularly climb over our fence to water it for us. He also loved to tell us about Belgrade and Serbia — and loved to talk. Last night, we were getting ready to eat dinner on the patio and Grant managed to get our neighbor to talk. As it turns out, the neighbor had thought we erected the extra fence to keep him, his granddaughter, and her friends from being so friendly. He called it our version of the Berlinski zid — the Berlin Wall. We are now back on friendly, neighborly terms with each other and he even gave us a brochure about a Serbian vineyard on the route to Budapest because Grant had mentioned we are thinking of going there. I’m glad the misunderstanding has been cleared up! Language and culture barriers can definitely increase misunderstandings about even the smallest things, but misunderstandings can happen between anyone. Do you have any funny or interesting stories like mine?